Braun Strowman has been breaking things lately. Two weeks ago he broke Roman Reigns, and last week he broke the ring. Chris Jericho heads to the ring for The Highlight Reel. Jericho welcomes everyone to the final Highlight Reel on RAW, because he’s going to beat Owens for the US Title on Sunday which means he’ll be moved to SmackDown. For the last Highlight Reel, he needs a huge guest: himself. He starts to address Kevin Owens when The Miz and Maryse come out and interrupt. Miz says that RAW is no longer Jericho, and it hasn’t been since he and Maryse arrived. RAW is all about the “It” couple. Jericho says Miz better watch… it. Regardless, Miz says The Highlight Reel has been canceled and replaced by Miz TV. He has the ring crew change the set. As Miz begins to introduce Miz TV, Dean Ambrose interrupts and heads to the ring. Ambrose agrees with Jericho that Miz is a stupid idiot, even though Jericho hadn’t even said it yet. Ambrose then has the ring crew change the set again, now to The Ambrose Asylum. Ambrose first addresses Jericho, saying that he’s pulling for Jericho in his match on Sunday. Also, as an apology for ruining his jacket months ago, he presents Jericho with a new jacket: a sport coat with Christmas lights. Miz gets angry about Ambrose’s willful underachievement, and says the crowd should be thanking for The Miz. Ambrose has a gift for The Miz too though, Dirty Deeds. Jericho then adds Maryse to The List for being married to a stupid idiot. Good match. It had solid action that went back and forth. There were some good, strong moves from both guys. I really like how the finish played out. Jeff was attending to Matt on the outside after he’d taken a rough shot, and Sheamus pushed Jeff out of the way so the match could continue. Cesaro and Jeff got into an argument while the finish happened in the ring. It is a nicely orgnic way to build some slight tension between the teams, but they didn’t go overboard with it. I like it. After the match, Sheamus extends his hand for a handshake from Matt, and Cesaro follows suit. The Hardys seem reluctant, but eventually shake hands in a show of respect. Kurt Angle talks to someone on the phone but gets cut off. The Miz hung up the phone because he’s angry for being forced to wait. He’s also angry about what Ambrose and Jericho did. Angle tells Miz to find a partner, because he’s in a tag match later on tonight. Good match. Very fun and full of energy. Aries was especially energetic, flying all over the ring. I think this is a very good continuation of the feud, showing how the anger and frustration caused by Neville and Perkins’ alliance is getting to Aries and making him even more dangerous. They said a lot in this match without ever getting on the mic. Braun Strowman heads to the ring and gets on the mic. He considers everyone in the crowd trash, so when he stuffs Kalisto in a dumpster it’s like he’s stuffing everyone in there along with him. Kurt Angle asks Kalisto if he’s sure he wants to go through with his match. Kalisto is determined to stand up for himself, and Angle seems impressed. It really went about like you’d expect. Kalisto ran around and tried to avoid Strowman, and Strowman overpowered and toyed with Kalisto. It was fun for what it was, and the finish was nice, although I think they adjusted the rules for this dumpster match in order for the finish to work like they wanted it to. I’m pretty sure the rules of the previous dumpster matches stated that you had to actually shut the lid on your opponent, but that wasn’t the case here. Braun Strowman isn’t happy, and he takes his frustrations out on Kalisto by repeatedly slamming him onto the mat. He throws Kalisto into the dumpster and rolls it up to the stage. Officials (including Fit Finlay, Adam Pearce, and Jamie Noble) attempt to stop Strowman, but he persists and rolls the dumpster off the stage with Kalisto inside. Kalisto is strapped to a stretcher and wheeled away. Kurt Angle watches as Kalisto is loaded onto an ambulance. A special look at Roman Reigns. Bray Wyatt addresses Randy Orton. Wyatt can’t let what Orton did go. He can’t forget. Some wounds never heal. Wyatt will show Orton the same pain and suffering Orton caused Wyatt when he burned Abigail. It was a little sloppy and flailing, but it was short, so there’s that. Alicia Fox’s northern lights suplex still looks very good. After the match, Emma gets in the ring and hugs Dana Brooke. Charly Caruso welcomes Samoa Joe and Gallows & Anderson. She asks for their strategy. Joe says their strategy is always the same: strike first and annihilate completely. Enzo Amore and Big Cass make their way to the ring for the next match, but they are attacked on their way by Anderson, Gallows, and Samoa Joe. Anderson and Gallows hit Magic Killer on Enzo on the floor, then Rollins runs out to join the brawl. The fight makes its way into the ring before things begin to settle down. As we go to commercial break, Enzo appears to be knocked out. Back from the break, Kurt Angle announces that he has a replacement for Enzo Amore: Finn Balor. A brawl starts again as Balor heads to the ring, but eventually the referee rings the bell to start the match while Cass and Gallows are alone in the ring. Good match, and the energy was great. From the pre-match attacks, to the near-constant brawling, to the fast-paced action, this was a lot of fun. It really looked like each team was supremely pissed at their opponents and wanted to hurt them badly. This was a really good final match leading into the PPV. It builds a lot of excitement for a payoff. The Miz appears to try to convince either Sheamus or Cesaro to team with him tonight. Alexa Bliss makes her way to the ring. Alexa talks about how superstars like to talk. But she didn’t come to RAW to talk, she came to win. Bayley then comes out and heads to the ring. Bayley says she knows Alexa is making fun of her, but she’s not surprised. Alexa likes to talk behind people’s backs. But Bayley doesn’t like to talk, she likes to work to be the best. Bayley mentions that Payback is in her hometown, and Alexa is excited by the prospect of taking her title in front of her family. She basically calls Bayley a child, and that’s when Sasha Banks interrupts and heads to the ring. Sasha calls Alexa a troll doll and says that the woman with the gold calls the shots. Bayley will shut Alexa up on Sunday, but tonight, Sasha will be the one to shut Alexa up. Alexa says she’s going to go to Kurt Angle to cancel their match tonight because Sasha is unhinged and she feels unsafe being in the same ring with her. Sasha says she’s sorry Alexa feels that way, then elbows Alexa in the face. This was more for the story than the action, and I think it works very well for Alexa’s character. After the match, Bayley tries to drag Alexa Bliss back to the ring. Alexa runs off, but when Bayley turns around Alexa attacks her from behind. Sasha chases Alexa away, then tends to Bayley. Dean Ambrose wants to move past the problems he and Jericho have had in the past. As part of that, Ambrose wants to be taken off the list. Jericho reminds Ambrose that he still owes him $15,000 and that Ambrose powerbombed Jericho onto thumbtacks. But in light of the jacket Ambrose gave him, Jericho takes Ambrose off The List. But as Ambrose walks off, Jericho smirks and writes something on The List. Charly Caruso welcomes Heath Slater and Curtis Axel, stars of The Marine 5. The Miz and Maryse join them, and Miz says he’s has the role of a lifetime for one of them: The Miz’s tag partner tonight in the main event. Slater says he already has a partner, and Rhyno walks up. He attempts to give Maryse a cracker, but she doesn’t want one. The Miz then receives a note which apparently has the name of his partner for tonight. The Miz seems pleased. In the ring, Curt Hawkins issues an open invitation to the Curt Hawkins Star Factory. Apollo Crews accepts the invitation. This was a good exhibition for Crews. It showed his speed and power. I hope he can find some traction on RAW. After the match, Titus O’Neil enters the ring and raises Crews’ hand. Crews doesn’t seem too enthused. An inside look at the rivalry between Braun Strowman and Roman Reigns. Austin Aries pitches an idea to Kurt Angle. Angle then asks Miz if he found a partner for tonight. He says that he has, then Elias Samson walks by in the background. Ambrose and Jericho make their way to the ring for the main even. Miz and Maryse follow. In the ring, The Miz attempts to introduce his partner, but no one comes out. Miz wants to postpone the match, but Kurt Angle comes out and says, regardless of whether or not he has partner, the match will go on as scheduled. 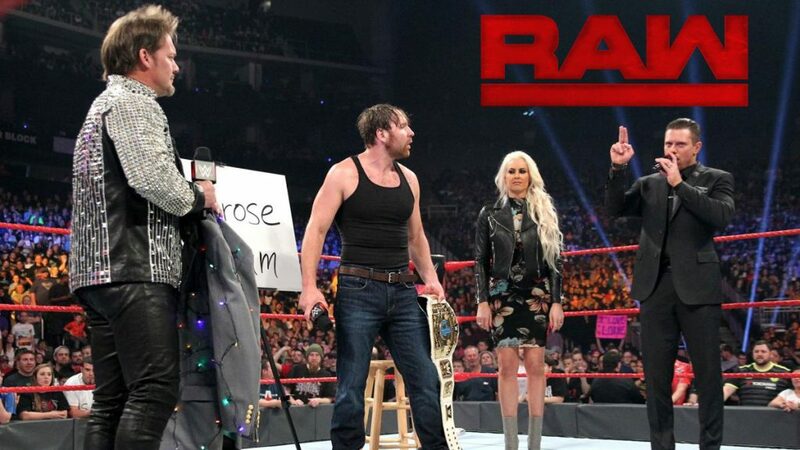 As The Miz protests, Jericho and Ambrose start their attack. This felt like a little bit of an anti-climactic ending to the show. The match itself didn’t feel like a main event, probably in large part due to the fact that it was a handicap match. Also, Bray Wyatt appeared near the end of the show which just made things a little confusing. The bell never rang to end the match, and Bray Wyatt doesn’t really have anything going on with any of the guys in this match. I understand that this was just supposed to show Wyatt dominating everyone in his first appearance in the RAW arena since his return to the show, but it just felt underwhelming, especially since Wyatt is spread pretty thin with his stories involving Orton and Balor as well. It appears as if Ambrose is about to put Miz through the announce table when the lights go out and Bray Wyatt appears. He attacks Abrose, hitting him with Sister Abigail into the LED board on the stage. Wyatt and Miz take Jericho to the ring where Wyatt hits Jericho with Sister Abigail. As Wyatt stands over Jericho, The Miz puts his hand on Wyatt’s arm in celebration, be he too gets hit with Sister Abigail. Bray Wyatt kneels over The Miz as the show goes off the air. I thought this was a pretty good show, but I was a little let down by parts of it. The bookends of the show with Jericho, Ambrose, and Miz, were okay, but not super-great. The handicap match main event was underwhelming as I explain above. Also, the dumpster match and the women’s matches aren’t really anything I’d go back to watch again. I like the tag title stuff, the six man tag match, the cruiserweight match, and talking segment with Alexa, Bayley, and Sasha though, so I think this RAW was about 50/50. This match had the most energy and did the most to make me interested in the associated matches at Payback. The cruiserweight match and the tag title stuff both come in close behind the six man tag as my favorite parts of the night.